This post has been immensely inspiring, so much so that you've made this lurker of your blog finally post up a comment! I'd like to take this opportunity to thank you for your good work here as well, great stuff, and do keep them coming! One of the common threads when working with a brush seems to be "just do it and don't worry about it." This is so helpful and so very inspiring. 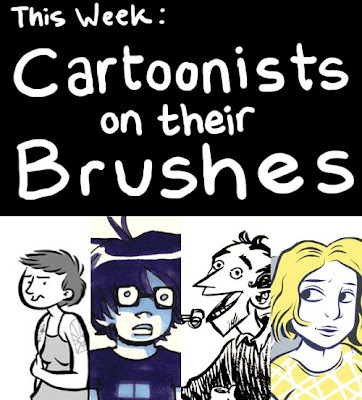 I find that most comic artists have been using brushes lately as opposed to say microns. It's scary, but I think I may start. I've been using microns and while I like it, I don't think it gives it the juicy immediacy of a brush stroke. Lars: I'm not really sure how you mean? Using expensive brushes, using a technique that kills expensive brushes, Erika says to ink your "babies", and generally it seems like you just have to keep inking in spite of mistakes to get good at the brush. You only understand how to change line width with a brush if you push on it. That's true of any tool I think. I can't name any tool that you don't need hands-on practice to be good at. This is an insightful post, but in all the discussions I've read about artists and brushes, seldom is there talk about the productive lifetime of brushes and the backlog of half-dead ones that build up on your desk. You clean them and pamper them and always point them to dry, and you're lucky to get a hundred pages out of it before ...*sigh*... it's just not the same anymore. Not good enough to do any serious inking with, but too good to throw out. So you buy a new one, and the pile of brushes in palliative care grows. Or is this just my own particular brush neurosis? A hundred pages seems on the low but still totally normal end of a brush's lifespan. Every tool wears out, though. Especially ones made out of hair. It did take me a while to come to grips with a good brush's impermanence, but I still have difficulty throwing them out once they're past it. Mine tend to go blunt rather than splay, which may have something to do with my technique. Your "heli-hand" concept was helpful. How is it you're so wise, young cartoonist? I'm a high-functioning autistic and I'm able to be more obsessed than most people. It's like being born some kind of super-nerd. May you continue to use your powers for good, not evil. Reading over your website bio and your MySpace page, I can see you're a man who's extremely comfortable promoting yourself and your work, which no doubt has much to do with what success you've had an an illustrator, as art is as much abut connections as it is about talent. But generally, when you see a comment that spends one line vaguely praising a post followed by seven lines of the commenter talking about themselves, their upcoming work, and giving their website, it usually means you have a comment spammer who goes around to various blogs using the comments as a promotional tool. As a general rule of internet etiquette, leave your comment, your name, and your website, tops. This will keep you from being mistaken for someone inappropriately using other people's comment threads as a means of promotion.